Six 6 Dining Chairs Antique Carved Wood. This set of 6 antique dining chairs with leather cloth (not leather) seats and elaborately carved backs was probably made around the late 1800’s. They arrived at the shop with a similar table in oak which is listed separately. The price is for six. Each chair is 45 cm wide 45 cm deep and 85 cm high at the back. Lakeside window Saturday night. 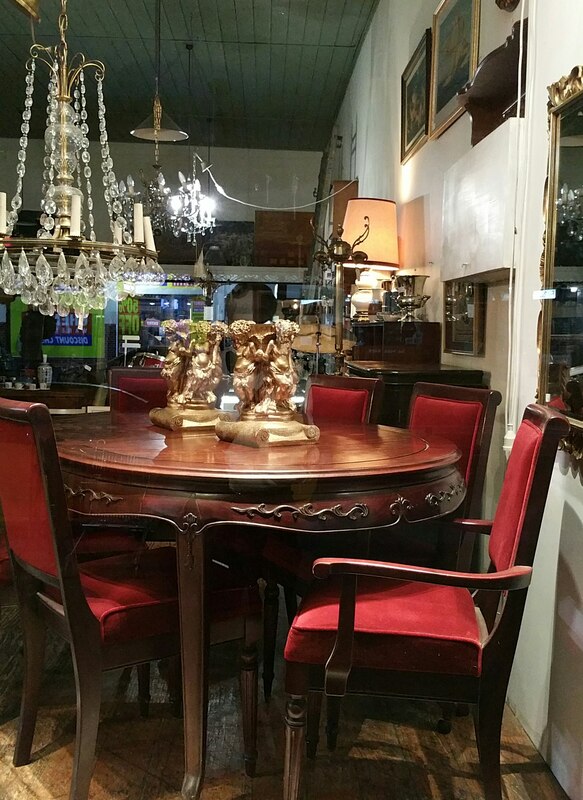 Extension table from Hong Kong, 490 dollars in Rosewood. Chandelier from Paris France 750 dollars for the dining table 8 chairs available, 49 dollars each.